IAB Canada last week released its annual digital ad spend figures, and the headlines are impressive. 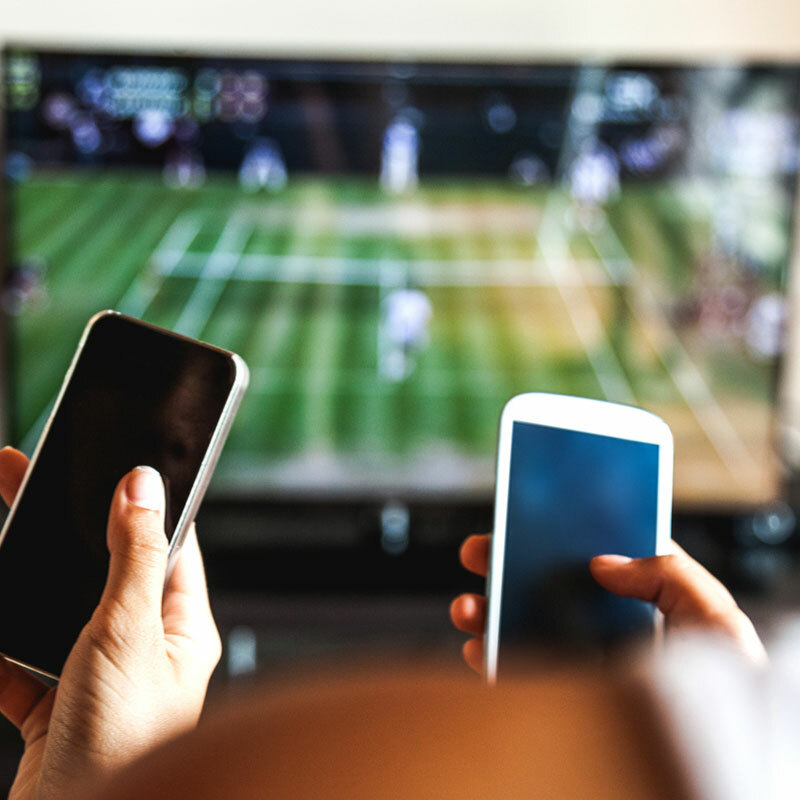 In 2016, digital ad revenue reached $5.5bn in Canada, growth of almost 20% over the $4.6bn recorded in 2015, and making it comfortably the largest medium for advertising in Canada – in contrast, $3.2bn was spent on TV ads in 2016. Look beyond the big headlines, though, and there’s more nuance within the data, and some thought-provoking trends. For example, the data demonstrate that the share of digital ad revenue taken by the 5 biggest platforms continues to grow, and that for all the growth in total digital ad spend, very little of that has trickled down to other publishers. No word on which those 5 biggest are: Facebook and Google are the most obvious members, answers on a postcard for the other 3. 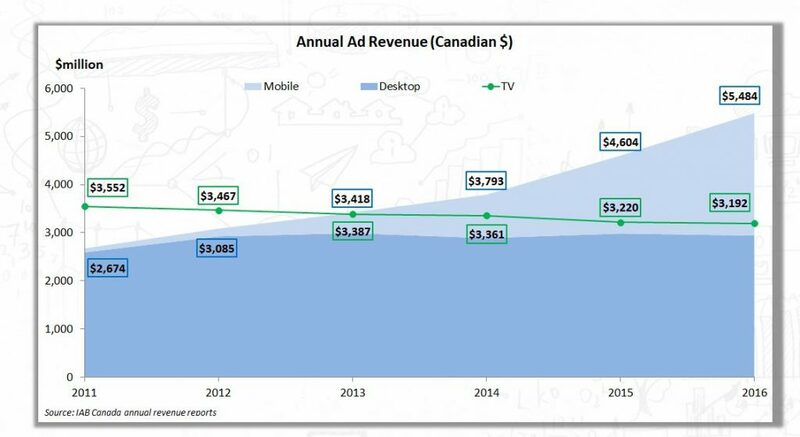 Moving on, the IAB also splits out ad revenue in Canada for “mobile” (including all digital ads for smartphones, tablets etc) and “online”, referring specifically to more traditional internet ads on PC. (Finding the right term is a bit challenging (what’s the opposite of mobile: traditional? ), but the definition is pretty clear). And what you see first in those mobile and PC figures is that desktop online adspend has stalled since 2012, at $2.9bn. Virtually all of the growth in spending on digital ads in that time has come from the stratospheric increase in mobile advertising. 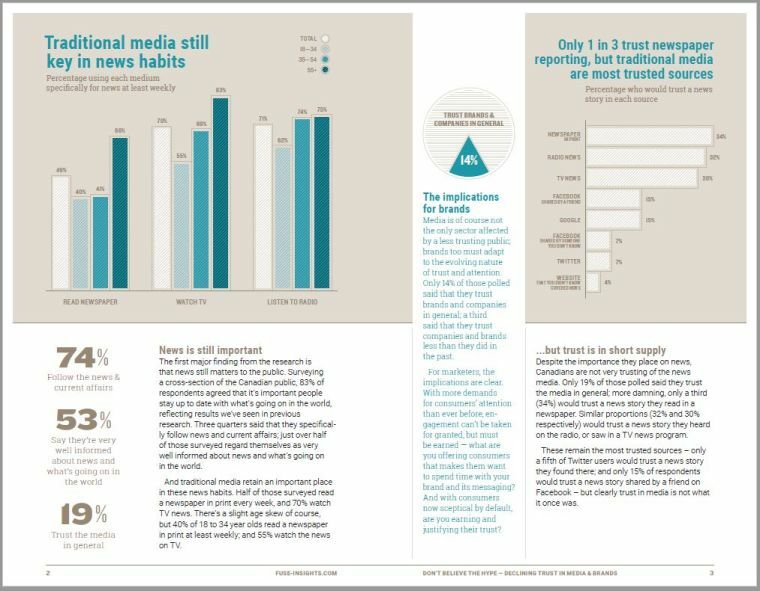 The second thing you see is that, despite the headlines, TV remains the most important screen for advertising in Canada. TV ad spend has declined slightly over that same period, but brands still spend more on TV ads than on desktop (“online”) advertising. And in fact it’s only by combining mobile and PC ad spend figures that the IAB and other boosters of online can say that more is spent by brands online than on TV ads. [One could argue either way whether it’s justified to combine the two channels (publishers sell ads across both screens; but consumers use desktop and mobile in quite different ways), but that’s a different discussion]. So what conclusions can be drawn from these figures? Well, first, that any publisher not offering mobile ads is unlikely to see much revenue growth. Second, that even if they do offer mobile ad solutions, unless they’re Google or Facebook or one of the 3 other biggest platforms, they still probably won’t see much growth. 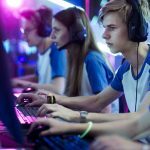 But third, and most intriguingly, is that it looks like advertisers have reached a limit on what they spend – or what they can spend – on online ads for PC. And that limit is less than what they spend on TV. Mobile advertising hasn’t yet reached that figure (2016: $2.5bn) and is still growing strongly, so in the next couple of years we’ll see one of two things. Either mobile will become the most important screen for advertising, and ad spend on mobile will exceed any other medium in Canada. Or, it too may also hit a ceiling – maybe there is a limit to what advertisers can spend on any screen. Time will tell. But in the meantime, what do you think will happen – and why?